My bike computer had been complaining about low battery several times yesterday. I had even changed the battery for the second time on this trip while eating second breakfast in Pilot Grove. 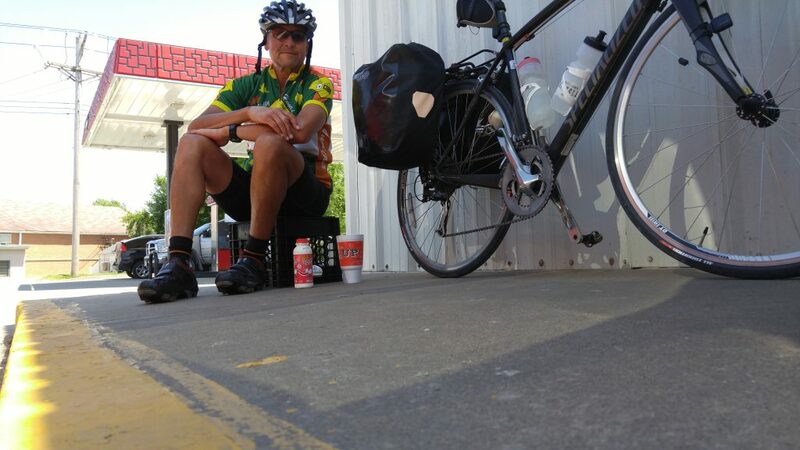 At the end of that day, while on the Katy Trail, I got another message about low battery. It finally occurred to me that there are batteries in 2 places. 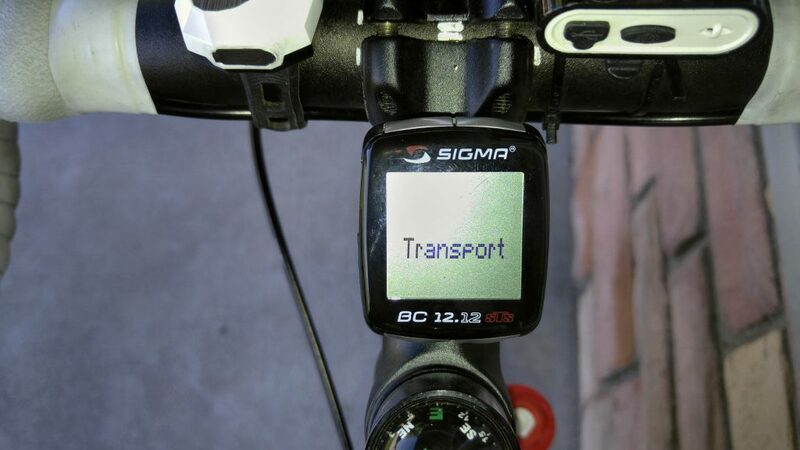 The main unit that displays all the data has one and there is also a battery in the transmitter/sensor that sits on the fork near the front wheel. With Ed and Betty’s help, I installed new batteries on the unit. Unfortunately, nothing was being transmitted. We’d spin the front wheel, but the computer kept blinking zeros at us. 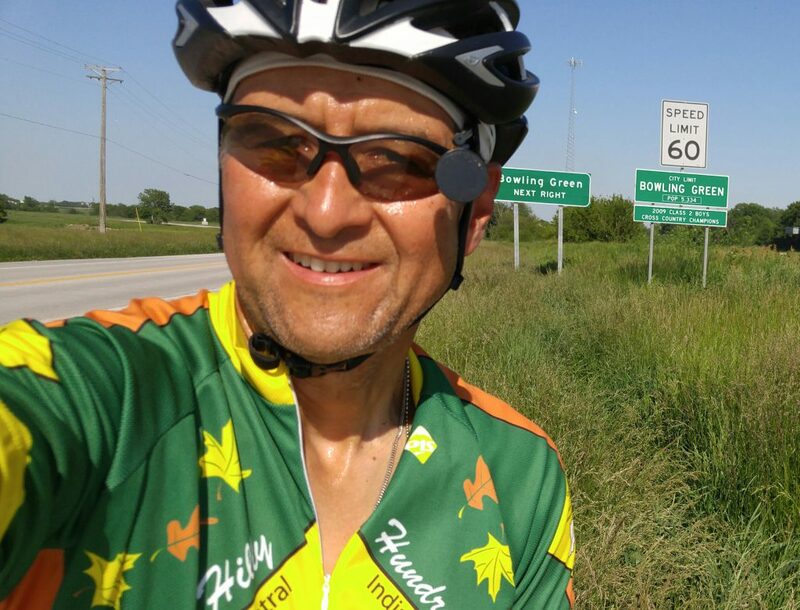 I was frustrated, but it certainly wasn’t going to stop Hidalgo or I from completing the day’s ride. Hidalgo went a little brain dead today, but he was still riding well. I took many of the suggestions that Ed and Betty gave as far as a route. Without feedback from the bike computer on mileage, I had to refer to my phone and Google maps more frequently. It reminded me of the rides I took in summers during college. Back then all I had was a gas station map, my watch, and whatever signage that might be found. There was no feedback about speed, or more importantly the distance to the next town. It was old school navigation and feedback. Look at your watch, look at the compass, look at the signs. Just don’t look to the computer for help. I am a very analytical person. I have kept an exercise log for more than 35 years. I have Quicken data going back 20 years. To be without the bike computer was driving me nuts. I was like Sheldon Cooper forced to sit somewhere other than his favorite place on the couch. There was no bike shop available or open along today’s route. But it didn’t rain. The sun was out. The temperature was mild. Sometimes the wind was even at my back! Then there is the kindness of strangers. 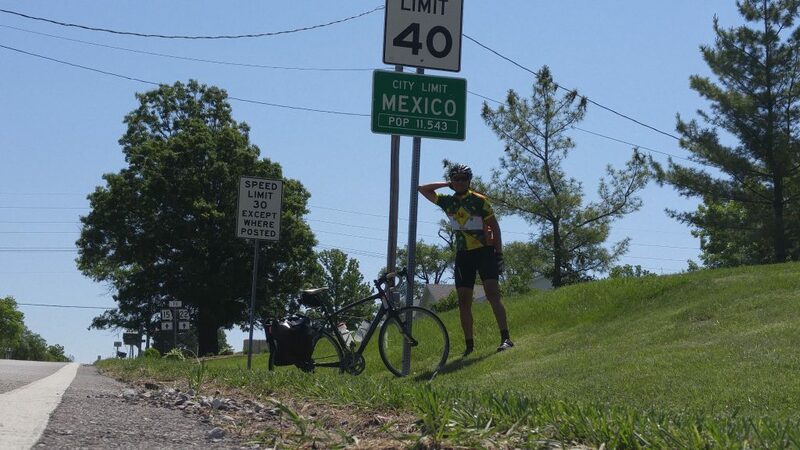 When I got to Mexico (Missouri, not Los Estados de Mexico), I was tired and hungry after my first 35 miles. I try to eat at places other than franchises if given the chance. 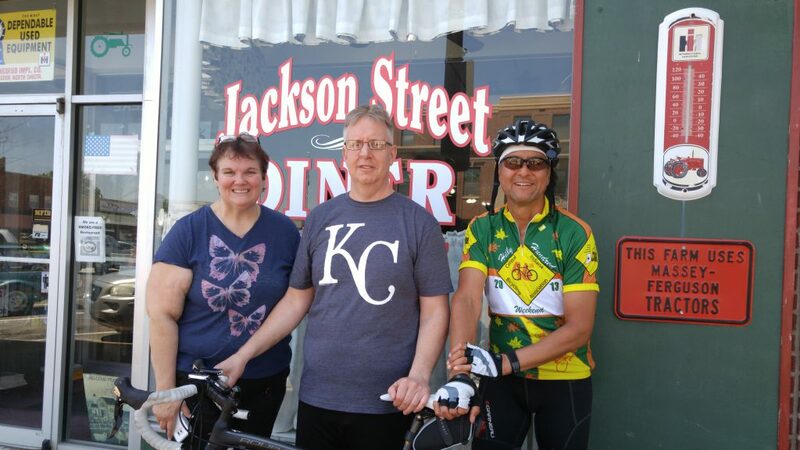 I rode near the center of town and found the Jackson Street Diner. I ordered an excellent second breakfast. 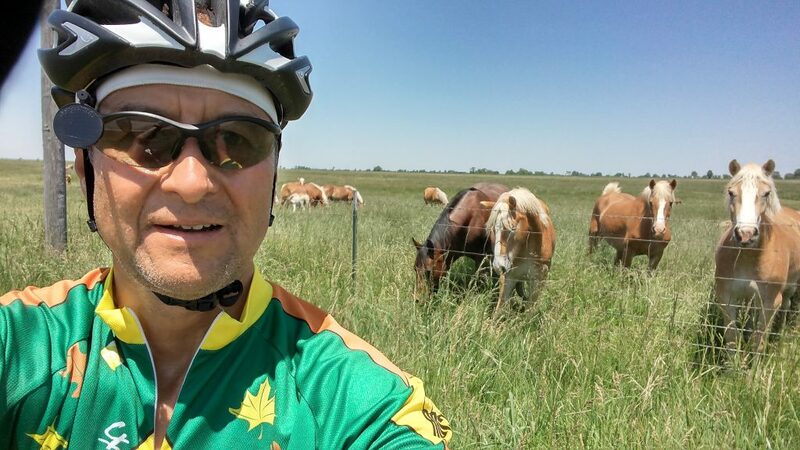 I usually draw a bit of attention wearing the biking shorts, helmet, and jersey. A man came over and asked where I was riding. I gave him both the short and long answer. The short answer was about today. The long answer stretches back to Oceanside and ends in Annapolis, with conversations about mentoring along the way. He was also a biking enthusiast. Karen and Bill Potter are wonderful people. Maybe I’ll let Bill ride Hidaldo for a bit next time. The woman who was serving me heard the conversation and took away my bill. Turns out the owners just bought my breakfast. When we stepped outside for a picture and a closer look at Hidalgo, they introduced me to a woman who had opened a “clothing store” for foster children. The kids pick out some things they need, but everything is donated to the kids welfare. Jodi also is a parent to 4 foster children as well. I was feeling pretty good when I got back on the road as the computer went from displaying zeros to “Transport”. 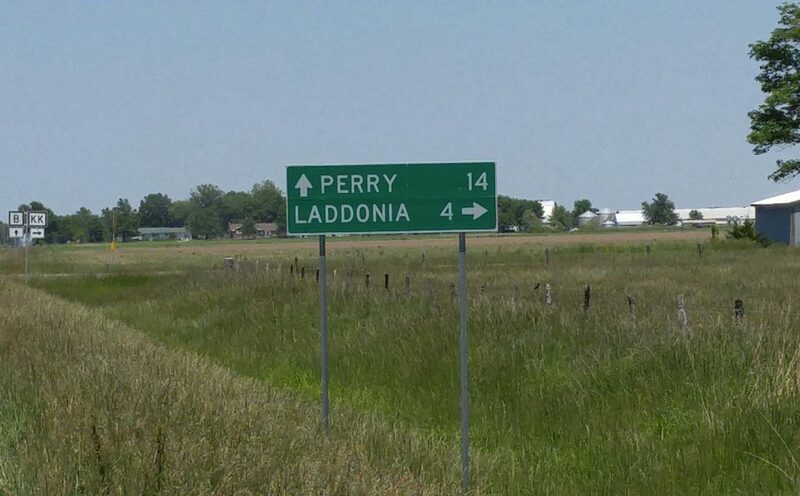 It didn’t matter as the light wind was at my back on the way to Laddonia and Vandalia. 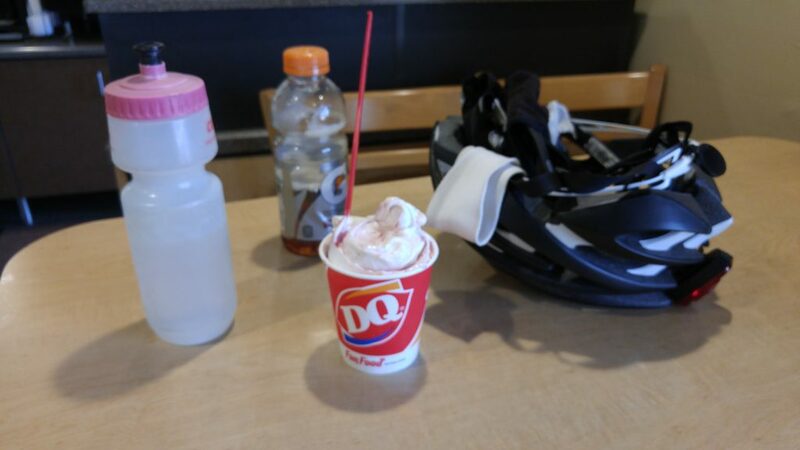 Ice cream fix in Vandalia before the final 17 miles push to Bowling Green. 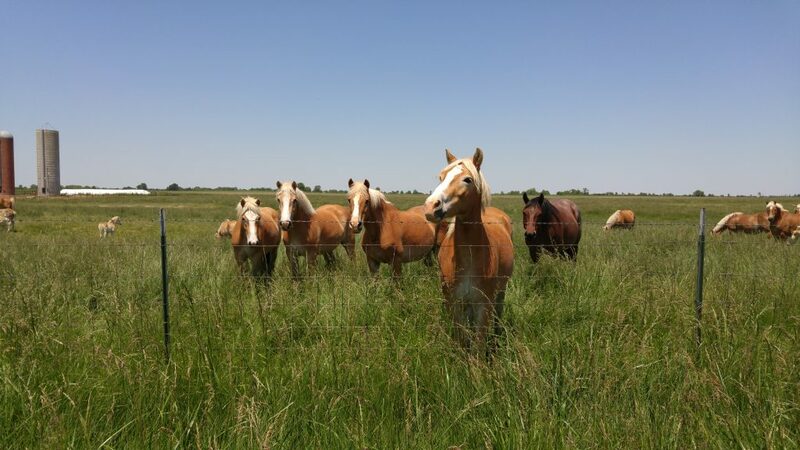 I had to battle the rumble strip on US 54 into Bowling Green for a couple of miles, but I had caught some nice sights and good snacks in both Laddonia and Vandalia. I made some calls before I got to town and found an opening at the cheaper of the 2 hotels. All the places I have stayed will cover my basic needs. Clean room, hot shower, working fridge and microwave. I need an adequate Internet connection, but I don’t care if there is a TV. This hotel had all that. Like many of my last few cheap hotels, they tend to lack some of the little things. There is no plug in the sink. When I wash out my socks and underwear that is an issue. There is only one clothes hanger. I asked, but they don’t have any more. I had to ask for a couple of hangers in Harrisonville, too. There is no breakfast – “continental” or otherwise. That’s been the case since I entered Kansas. I have to shop the night before to scrounge up something for breakfast. Usually it is a trip to the grocery or convenience store. Into Bowling Green for another cheap motel. Tonight was no exception. I stayed in my biking clothes a little longer. I dropped the panniers in the room, got my string bag, lock and cable, then headed for the grocery store 1.9 miles away before they closed at 6 pm. The lady working the deli area took the time to wrap my styrofoam container of fried chicken and pasta salad in plastic so it wouldn’t leak in my bag on the way back to the hotel. She said her dad used to bike 8and she completely understood my situation. I was hoping get to add some kind of breakfast sandwich to the milk and bananas for tomorrow morning. Unfortunately, they didn’t have any. I struck out with the convenience store down the street. I passed a Casey’s on the way back to the hotel and struck out there as well. I had one more chance with a Shell station a quarter mile from the hotel. They had nothing out. The lady working said the have them in the morning, but she was kind enough to go in the back storage and take a look for me. She came back with 5 choices and offered to heat them up for me. I told her I had access to a microwave, so having it cold was fine. More kindness of strangers. Best part of the ride.